Is this what FIFA 25 will look like? Over the last couple of years we've been hearing a lot from the big tech companies about how virtual reality is going to change our lives, and now we're finally starting to see some actual hardware and software appear on the scene. Take this new Nike promo video for example, which lets you play football as Brazilian soccer superstar Neymar. 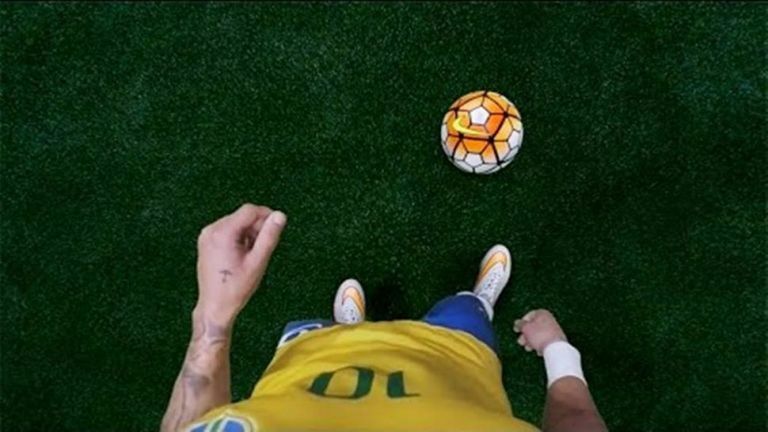 Well, sort of - you can at least peer around in 360-degrees while the Barcelona player does his stuff on the pitch. It's best viewed with a Google Cardboard player, but YouTube supports 360-degree video too - click and drag with the mouse if you're watching on a computer, or just move your phone around if you're watching on Android. It's a neat trick that shows off both the pros and cons of today's VR experiences. It could make console games like FIFA and Pro Evolution Soccer more immersive than ever, giving you a player's perspective on the action; but it's also pretty difficult to gaze around and follow the action at the same time - how do you know which direction to look in? It pretty much sums up where virtual reality is at in mid-2015 - plenty of exciting potential but still some way short of the finished article. With more gadgets and apps on the way, there's a lot to look forward to. Nike's new VR effort is in honour of a new Neymar-approved pair of Hypervenom II boots, which you can go and pick up if you prefer actual physical sports to the VR equivalent. Don't forget to check out our guide to Oculus Rift.